A scannin electron microscope (SEM) eemage o a single human lymphocyte. 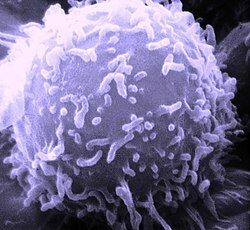 A lymphocyte is ane o the subteeps o white bluid cell in a vertebrate's immune seestem. This page wis last eeditit on 15 August 2017, at 04:30.